We should not start sanctioning GPs for their antibiotic prescribing until all the data is widely available so they and their managers can benchmark their behaviour against everyone else. There is a disturbing amount of variation in the number of antibiotic prescriptions issues by GPs in England. About 60 practices (out of a little under 8,000) prescribe at a rate more than ten time higher than the national average and more than 300 at a rate of more than double the national average. at the other end of the scale about 200 prescribe at less than half the national average rate. (all these numbers are based on the calendar year 2014 when more than 35 million prescriptions were issued). Even if we average across whole CCGs there is a lot of variation. 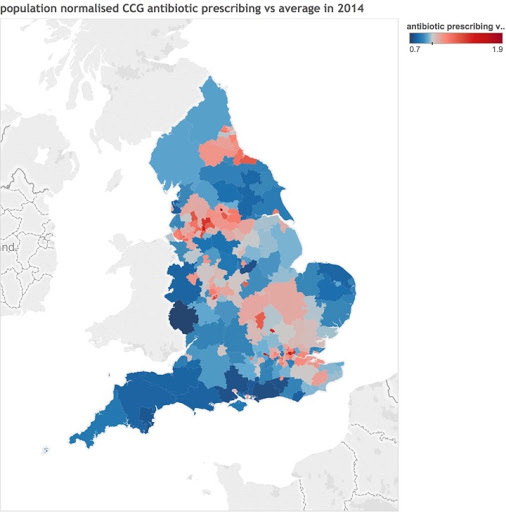 Here is a map of the relative amount of prescribing at CCG level (all numbers are normalised for the population mix of the people on GP lists, taking account of the distribution of different age groups). The average number of prescriptions in the top CCG is twice the national rate and the lowest prescribing CCG prescribes just two thirds of the national number. We can see that the GP variation is much wider in the next plot. 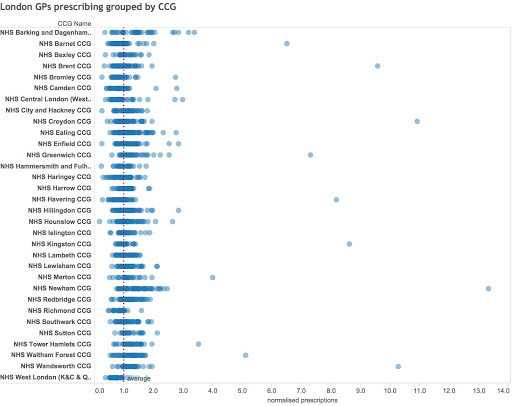 In this chart each blue dot is an individual GP practice and all are shown relative to the population-normalised national average number of prescriptions. 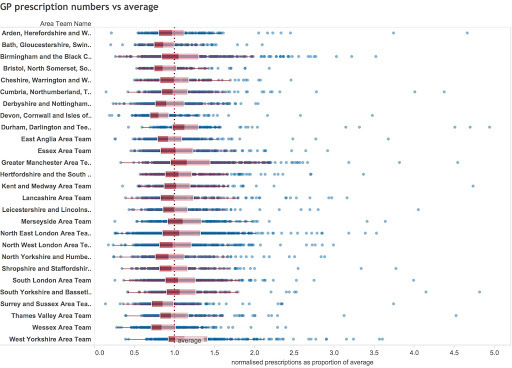 The red marks are box-plots, a statistical way of summarising the amount of variation in each (old style) NHS area team. The two-colour red blocks show the median (the middle line) and cover 50% of all the GP practices within each area. The plot excludes the 80 most extreme GP practices. we can drill into this data to see some further detail for a region. The chart below shows every GP in london grouped by CCG. Of course, some of the most extreme outliers here might be anomalies caused by GP practice closures or openings mid year (I don’t have the local knowledge to fix this without a lot of work). But the point stands: there is a lot of variation and no good reason to explain it other than GP behaviour. We can even drill further into the data to look at the mix of antibiotic types used by each practice. 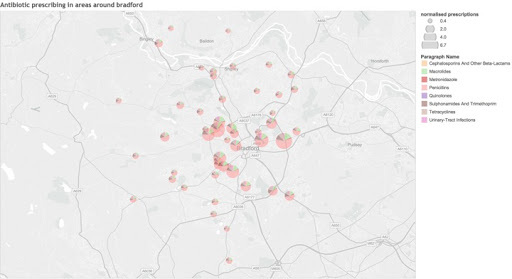 This map shows the mix and relative amount of prescribing in Bradford and Bradford Districts CCGs (the city and the surrounding area). The size of each pie is the relative number of prescriptions with the volume of each class of drugs as the size of each slice. Not that the GPs in the city seem to issue far more prescriptions than the GPs in the surrounding area. The mix is also a little different. I show these analyses not to heap criticism on GPs but to show the sort of analysis that should be used to help analyse and challenge the variation. The NHS doesn’t have accessible analysis that does this job. What is accessible and free is a clunky, awkward and obsolete system called ePact provided by the NHS BSA. This system is free to GPs and Medicine Managers (the people whose job it is to challenge GP prescribing behaviour). It manages to be bad value for money despite being free by requiring vast amounts of time and effort to use despite not making access to all the relevant national data easy. My analysis is based on the publicly available monthly data downloaded from the HSCIC website (it’s a lot of data with nearly 600 million rows of GP-level data so far summarising about 5 billion prescriptions). I store it in Google’s BigQuery tool and analyse it using Tableau. 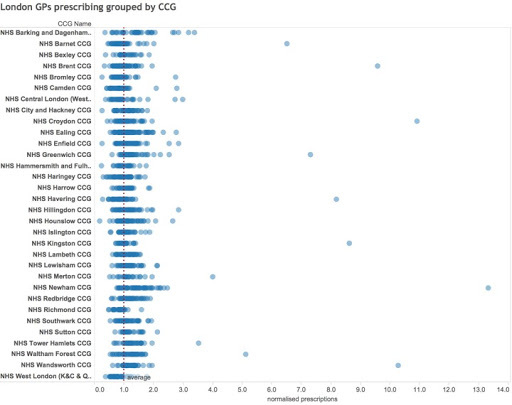 This makes analysing the entire dataset (with monthly data from 2010) interactive even if you want to see what a single GP practices does with a single formulation of an individual drug. Until the NHS has started to make this sort of analysis accessible to all GPs and medicine managers it is counterproductive and damaging to sanction the GPs for their behaviour. We know that, when benchmarking data like this is made accessible, the unwanted behaviours will change (or some of them will). The first step in changing unwanted habits is showing the data. we should not be complaining about it until that basic step has happened. This is obvious from the map at the top, which is basically an urban vs rural map.